What a wonderful weekend this was. It goes without saying that I had “to weber” some of our food; to be precise it was my task to barbecue Sunday’s lunch. As our house guest David is vegetarian it meant that I had a lot of “veggies” (as Australians commonly call vegetables) to prepare. But we had also fresh fish, a Pomfret as it is commonly known. There are two varieties, the white and the black pomfret. The Indonesians call the former “Bawal Putih”. White pomfret has an excellent flavour and is commonly used for a dish called Ikan Asam Manis (sweat & sour fish); needless to say that it is very delicious either steamed or grilled. First, I grilled the vegetables: potatoes (after they were boiled), onions, capsicum, green peppers, and zucchini. The fish was marinated with black olives and capers and wrapped in aluminum foil to keep it moist. I put it on for only about 20 minutes. The food was delicious and we had the right wine to go with it. We drank one of my last two bottles of Van Volxem Saar Riesling 2003. This wine estate is located in Wiltingen (www.wiltingen.de), a village about 20 km south of Trier at the Saar River, a cool climate region belonging to the Mosel-Saar-Ruwer area. The lower Saar is a very small winegrowing region but has some of the best Grand-Cru locations for Riesling (for instance Schwarzhofberg) on which its reputation is based. Van Volxem is the oldest estate in the Saar. Formerly a monastery, the estate belonged to the Van Volxem family for four generations. In 1999 it was purchased by Roman Niewodniczanski of the beer brewing Bitburger family. Based on old tax records, many excellent and sometimes forgotten vineyard sites were newly acquired when the estate was expanded. Most of the more than 20 ha are planted with Riesling vines. The first vintage was bottled in 2000 and ever since elegant wines with excellent ratings were produced under a system that avoids the German “Praedikat system”. Unfortunately, the estate’s internet presentation is still under construction. Therefore, we have to wait a while longer until you can visit www.vanvolxem.de. The soils of the Saar are based on blue-black slates and very stony. 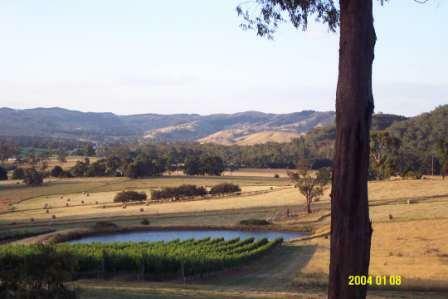 The vineyards are located at steep southerly slopes. The key for the Van Volxem Estate’s success are late harvests and low yields, environmental friendly practices (no pesticides) and low input cultivation techniques (no chemical fertilizers), relying in the cellar on natural yeasts fermentations and maturation in oak barrels. The 2003 dry Riesling blend has 12% alcohol. It was the first vintage producing dryer wines. 2003 was a ripper year as regards the weather and this might explain the higher than usual alcohol content of the 2003 vintage. Some of the wines are produced from more than 100 years old vines. The 2003 Riesling is medium bodied, had a buttery aroma and displayed some sweetness. It showed some mineral characteristics, had a fruity nose and a long finish. It is terrible that I have only one more bottle left of this excellent vintage (www.riesling.de). Wines do not age well in the tropics, even if you keep them properly refrigerated. There is always the odd power failure which destroys your well thought through cellaring program. The drinking of Saar wine reminds me of my youth when my father and his friends used to go hunting in Schoden, a village further upriver. Often groups of hunters would descend on the Saar villages after successful campaigns and dine in one of the old rural inns (Gasthoefe). When at home with my mother in Trier, we often set out for long walks in the forests covering the hills above the Saar. From there one has a magnificent view of the lovely countryside. 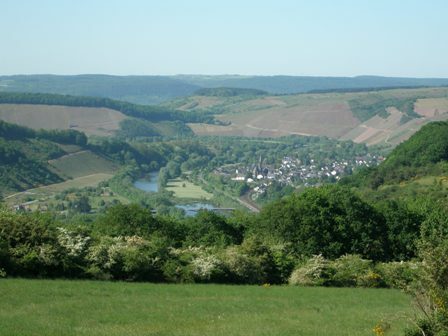 The Saar Valley, the village of Biebelhausen in front on the left side of the Saar, behind the terroir “Ayler Kupp”, and to the left further back the famous village of Ayl. Today is the National Day of Australia (1788) and our family and friends down under are celebrating. For us in Jakarta it is just a normal working day. Like every morning at 6h I woke up my girls to get ready for breakfast and ultimately school. I enjoy waking them very much because it gives me the chance to hear their first words of the day. And because I frequently work late at night, I often do not see them again in the evening, the mornings are a chance not to be missed. I followed over the last couple of days the controversy about the flag ban for concertgoers of the Big Day Out music concert in Sydney. The fact that the ban caused such a storm among the public including politicians and scholars, I found interesting. As a German I personally have still severe emotional reservations about national emblems such as national flags and national anthems which is not surprising for people from my generation born after the war. While travelling as a young man I would always answer questions about my origin with “European” and only later admit to my German nationality. However, I was very happy to see during last year’s soccer world cup that many Germans have developed a more normal relationship with their national flag and were proud to display it at the games. The only national flag I possess is the one of my host country Indonesia which we fly on 17 August, the Indonesian National Day, celebrating the freedom Indonesians gained on that day in 1945. My children also like to sing the Australian National Anthem. They sang it every Monday morning at the Dixons Creek Primary School which they attended during extended holidays over a couple of years every June/July. I like to join in when they sing the anthem. In fact I would rather sing other national anthems than the German one, for instance the French one (La Marseillaise) or even the American one (The Star Spangled Banner). Startled by these thoughts I did some research on the internet to find out more about national anthems. Many of them are a celebration of freedom which for me as a modern-classical liberal is worth being celebrated. In the Australian case, the second line says “for we are young and free” and in the German case the anthem opens with “Unity and right and freedom”. I knew that the German National Anthem was composed by Franz Joseph Haydn and that the text came from August Heinrich Hoffmann von Fallersleben (das Deutschlandlied). I also knew that the third stanza was selected after the Second World War as the official anthem and that the first one was dropped. What I did not know was that in about 1840 when it was written the introductory line, which I always found so repulsive, “Germany, Germany more then all, more then all in the world”, had of course a very different meaning. At that time Germany did not exist, we had only a large number of German monarchies and some republican free cities. Instead the song was an appeal to all Germans to finally unite. I only identified it with the Nazi’s quest for German superiority. The stanza depicts to some extent the lighter, more joyous and life embracing character of the German people. Von Fallersleben had intended the text to be used as a simple drinking song. And of wine drinking songs we can never have enough. The weekend came and went like a storm, exhausted I am sitting on my desk at Monday lunchtime and contemplate about the good times gone by. As always, we had great food on Sunday. My wife Margit prepared a “Wehlener Specksalat”, which translates into English as “Wehlener potato salad”. With it we had a wonderful fresh water trout. The wine we enjoyed with the food was a Riesling of course, a 2003 Kaseler Riesling from the Reichsgraf von Kesselstatt Estate. The settlement of Wehlen/Mosel is part of the district of Bernkastel-Kues, a small but famous town in the Mosel valley, about 50 km downriver from Trier. Wehlen has one of the best vineyard sites among the Middle Mosel producing outstanding Riesling wines. The world renowned site is called “Wehlener Sonnenuhr” (Wehlener sundial). The vines are cultivated on steep slopes (50%) on an altitude between 110 and 190 meters above sea level. The soils are very stony and are classified as Devonian slate soils. The wines produced are elegant and deep, full-bodied and fruity. Wehlen goes back to Roman times when Celts established this village. The settlement has a tradition of more than 1100 years of vineyard cultivation and wine production. In a historical document of 874 the Arch Bishop of Trier requires the vintners of Wehlen to deliver 10% of their produce to the local church. Only the vineyards allocated to local monks were excluded from this tax. Unfortunately, the website of Wehlen is only in German but you might still visit and enjoy the impressive pictures (www.wehlen.de). Peel the potatoes and cook them, still warm, cut them into cubes and mix them with the dressing; cut the beacon also into cubes, fry it in a pan and add it with the fat to the salad; keep the salad warm, mix it from time to time. Serve it with backed or fried fish, and/or sausages or other fried meats. We drank one of my last bottles of ‘2003 Kaseler Riesling’, Reichsgraf von Kesselstatt – The Riesling Estate (www.kesselstatt.com). Kasel is a small village at the Ruwer River, some 10km from Trier on the right hand side. When we were at high school my brother Wolfgang used to earn some pocket money by working for family vineyards during harvesting season. That’s hard work because the slopes are steep, the weather often wet and unfriendly. He reported about the great hospitality of the vintners and the fun he had with the co-workers of the labour crews employed for picking during vintage time. I never got to it and regret this now at the tender age of 52. Another lost opportunity. Reichsgraf von Kesselstatt maintains a beautiful website (www.kesselstatt.com) in three languages; German, English and Chinese. The latter made me very happy. Having lived in China and Chinese speaking cultures for more than eight years, it is always a pleasure to see Chinese characters. I guess that many of the Chinese tourists visiting Trier, the birth place of Karl Marx, also belong to the customers of the estate. Let us hope that many visitors from the Far East become lovers of wine from the Mosel river and its many vineyards, wineries and wine estates. Kesselstatt, by the way, owns also a vineyard in Wehlen (according to the website 0.3 ha) in the location “Sonnenuhr”. The “Neumagener Wineship”, replica in front of the Kesselstatt Wine Bar. Similar to the “village-system” of Burgundy, Kesselstatt produces regional wines. The fruit for this Riesling is sourced from around Kasel. Kesselstatt itself owns two holdings there (top locations Nies’chen 4.4. ha on a 60% slope and Kehrnagel 1.8 ha on the valleys finest sites). Some of the vineyards belonged to the St Irminen monastery. By the way, I grew up at Irminenfreihof 5 in Trier (the neighbourhood was locally also knows as Brittany), next to the monastery located in the middle of the city of Trier. This full-bodied fine Riesling shows all the characteristics of the typical Mosel Rieslings. It’s very minerally (because of the slate soil) and fruity, depicting pineapple, peach, apple and lemongrass characteristics. It’s is also well balanced, dry with a lingering finish. The alcohol level is rather high for a Mosel Riesling (12.5%). But 2003 was a most astonishing year. Throughout the year temperatures were higher then normal; the year was also much drier. Because of these favourable conditions growth was exuberant. When temperatures hit the 40° Celsius in August sunburns were widespread. The grapes ripened quickly and picking started much earlier along the Mosel river and its tributaries then in most years. The fruit picked was usually healthy and showed aromas which were not depicted in other years. Unfortunately, I have only another two or three bottles left of this treasure. I will reserve it for special occasions with more Wehlener potato salad and fresh trout. Today, I climbed from the heavans and my meetings with the celtic gods (remember Sucellus?) down to earth again. And a hot earth it is. From The Age (www.theage.com.au) I learned about the progress of the bushfires in Victoria. 950.000 ha of forest have already burnt down, which according to The Age is almost as large as Jamaica (it has a bobsled team). Mt Buller where it burns is only about two hours away from our vineyard in Glenburn. Some years ago I went skiing with my friend, Timo Meyer, Australian of Swabian origin, and his and our children for a day of racing down the hills. Timo is a vintner and a very sought after winemaker at Gembrook Hill Vineyard (www.gembrookhill.com.au). He is famous for his very fine palate. 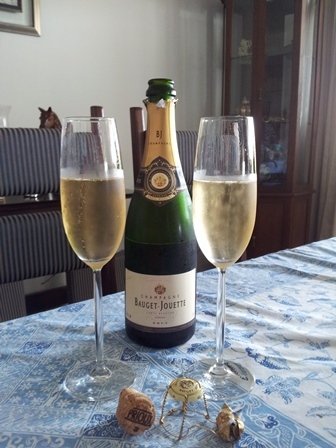 Timo made our second vintage of Sauvignon Blanc which in the end got us the bronze medal at the Singapore Wine Show. 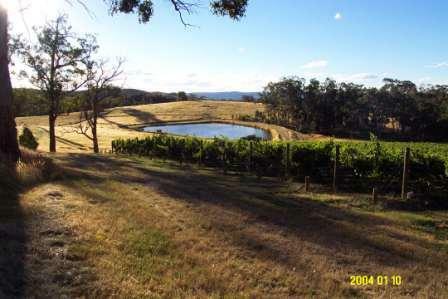 He has also his own vineyard at a very steep slope which is called “Bloody Hill”. His wines can be bought at Yarra Valley Dairy (www.yvd.com.au). 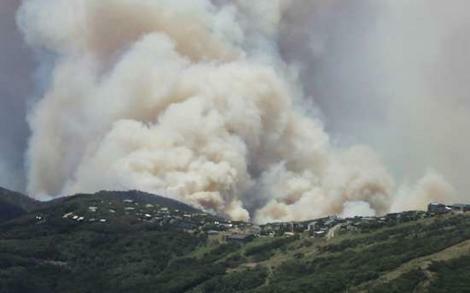 The picture below has been taken by Andrew de la Rue and it shows the fire raging near Mt. Bulller village. We are suffering under the drought for some years already. Because of the higher altitude of our vineyard loaction in Glenburn, we normally receive sufficient rain. Years ago we enlarged the old dam and built a new 13 megalitre storage. This kept us going. It did not rain much this winter (June to August on the southern hemisphere). I have never seen our big dam as low as in July/August 2006. Margit and I, we are of course a bit scared that some fires might break out in the nearby forests. Many of the fires are deliberatly lit by arsonists, others are ignited by lightning. The temperatures are high at the moment and together with the strong northerly winds, they make firefighting dangerous. It has been a strange year so far. 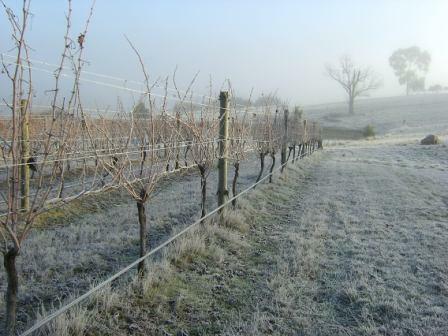 First, many vineyards were hit by two waves of late frost which destroyed in some places all the fruit at the vines. We at Two Hills were lucky. According to Steve Sadlier our friend, who manages our vineyard, we lost about 20% of the Sauvignon Blanc, 60% of the Pinot and about 40-50% of the Merlot. Some vineyards in the neighbourhood lost up to 60-70 % of their fruit, others lost everything. 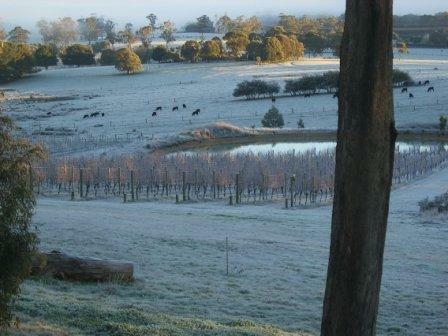 As a consequence the Victorian wine industry is suffering tremendous damages. Demand for fruit is strong. If we had only more of it. The old agricultural law prevails, that the economic value of a bumper harvest is usually lower then the one of a meager year. The frost damage will have lasting effects. Also the 2008 harvest will be lower because of the frost damage last year. Second, comes the drought and the fires. If Kinglake National Park start to burn, we will be in trouble. Below some pictures of Two Hills in winter 2006. Isn’t the place beautiful? There are various mythical stories about the god of wine in different cultures. For the Greeks it was Dionysos, for the Romans Bacchus and for the Celtic Treverer in the Mosel river valley it was Sucellus. Sucellus was not the god of the wine consumer as were Bacchus and Dionysos, but the god of the grape and wine producers, the vintner, the cooper, and the winemaker. The picture below shows this Celtic god as he is usually depicted, with a sledge (or long-shafted hammer), grapes and some barrels. The statue was found in 1976 in a Roman villa near Kinheim in the district of Bernkastel-Kues, 50 km from Trier downriver on the Mosel (www.bernkastel-kues.de). You can see it in a wonderful book by Karl-Josef Gilles with the title “Bacchus and Sucellus” . The book gives a wonderful insight into grape and wine cultivation along the Mosel river during Roman times. Today I want to take you to a small place in Central Victoria Glenburn, between Yarra Glen and Yea, about one hour northeast of the capital city of Melbourne. From there we drive about 5 km up north and turn right into Two Hills Road, a gravel road which will lead us to our vineyard. 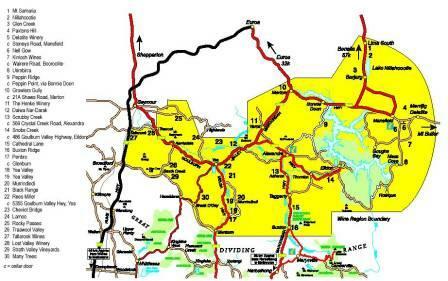 It’s all grazing land here surrounded by gum forests of the national park. Most residents are retirees; many are weekenders. 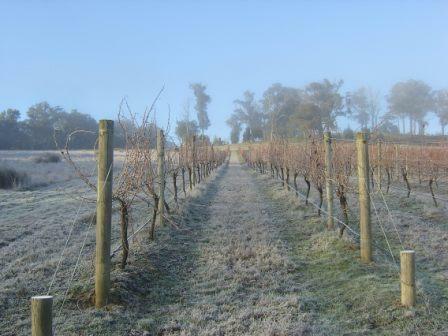 The vineyard is located on the right hand side on a 50 acres block (about 21 ha). It consists of about 1 ha Sauvignon Blanc (planted in 1996), 1 ha of Pinot Noir (planted in 2002) and 1.3 ha of Merlot (planted in 1997). The rest of the land is grassland with some small patches of gum trees and a small forest. A small river, Katy’s Creek, builds the boundary on one side. In 2001 we had our first vintage. Our Sauvignon Blanc of 2002 even won us a bronze medal at the Singapore Wine Show.The wines are available in Melbourne at the Old England Hotel in Heidelberg (bottle shop; www.oldenglandhotel.com.au), at the Berry Cafe in Dixons Creek (on the way from Yarra Glen to Yea) and in the Alexandra supermarket chain. In Germany my friend Dr Ulrich Hillejan (Gesellschaft fuer Unternehmensentwicklung mbH, www.s-h-r.de) sells our Merlot to other friends and family. At the moment we have only Merlot 2004 for sale. All the other wines have sold out which is of course good news for the producer and bad news for the consumer. 2006 was our most successful year so far. We had a good harvest (after a complete loss in 2005 due to adverse weather conditions), sold all our grapes, and most of our wines. The 2006 vintage of Merlot is ripening in French and American oak and will be bottled in March 2007. We are selling most of the fruit to other wineries. Living abroad is not very conducive to wine marketing. Another friend, Steve Sadlier of Vineadvice from Yarra Glen, takes care of the vineyard management. He is our viticulturist. Our wines are made by another friend, Alan Johns, owner and winemaker of Yering Farm Wines (please visit their website at: www.yeringfarm.com.au). The wine region is called the Upper Goulburn Wine Region Victoria (formerly Central Victorian High Country) and is promoted by various organisations among them the Upper Goulburn Winegrowers Association of which we are also a member (please visit their website: www.uppergoulburnwine.org.au). I took the map from this website. Unfortunately, it’s not up to date (we are not yet listed as members for instance) but it gives some idea of the location. You are currently browsing the The Man from Mosel River blog archives for January, 2007.